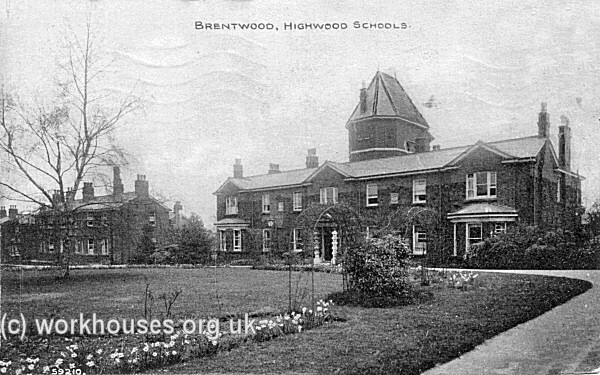 High Wood (or Highwood) Hospital at Brentwood in Essex was one of two institutions for the treatment of ophthalmia established by the Metropolitan Asylums Board, the other being the White Oak Hospital at Swanley in Kent. The MAB had been set up in 1867 to administer care for certain categories of the sick poor in metropolitan London. Its remit gradually widened and, in 1897, it was given responsibility for the capital's poor law children who were suffering from contagious diseases of the eyes, skin and scalp. Prior to this time such children, who then amounted to around 2,000 in number, had mostly been boarded out at establishments run by private contractors. 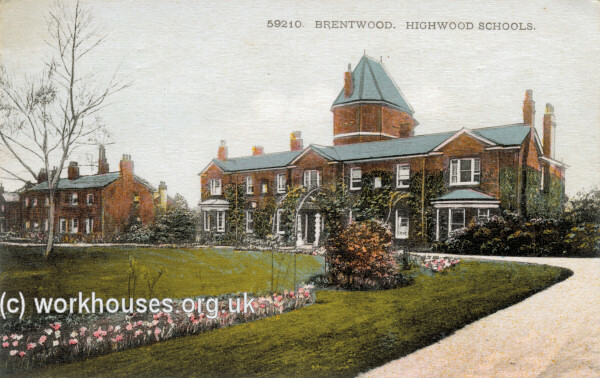 High Wood Hospital opened on 26th July, 1904, on a 28-acre site at Brentwood in Essex purchased in 1898. 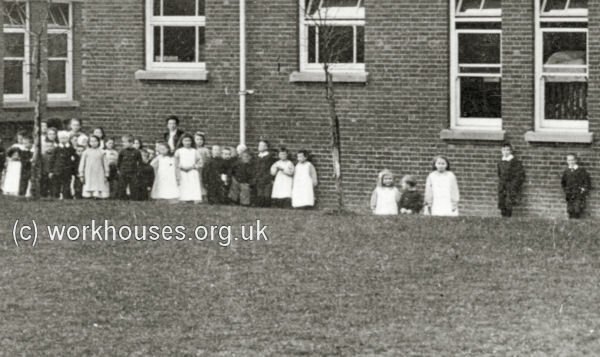 The buildings, designed by C and W Henman, could accommodate around 350 children. 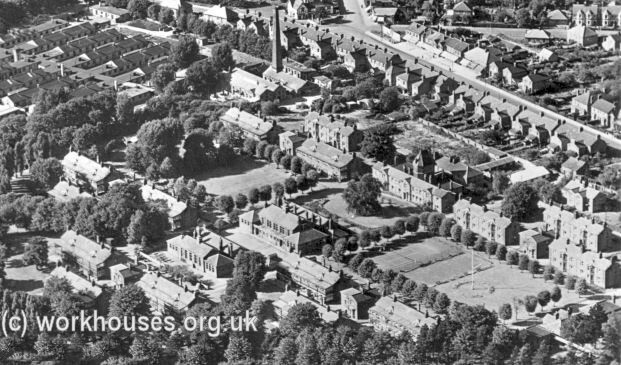 The hospital was laid out on a cottage homes plan with five groups of cottage wards arranged around two greens, at the centre of which lay two schoolrooms and an administrative block. The site layout is shown on the 1920 map below. High Wood Hospital site, 1920. 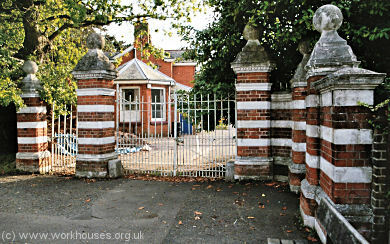 The entrance to the site at the north-east led past a gate lodge, originally the porter's house, and a single-storey porter's lodge, originally the hospital's dispensary. South of the entrance lay a single-storey infirmary block with two wings and a central administrative section at the centre. A small mortuary lay to its rear. The five cottage home clusters were named The Laurels, The Limes, The Poplars, The Rowans, and The Firs. Each cluster contained four blocks — two children's houses either side of a medical staff house, with a house for domestic staff to the side farthest from the central green. 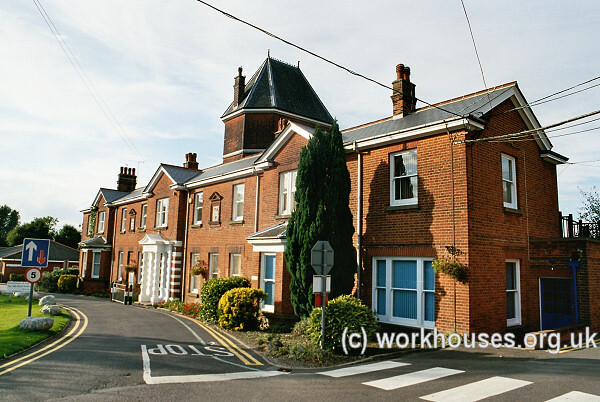 The children's houses were two-storey buildings with bay windows on their southern side. Each had dining rooms and play rooms on the ground floor with dormitories above. The main administrative block stood at the north of the site. 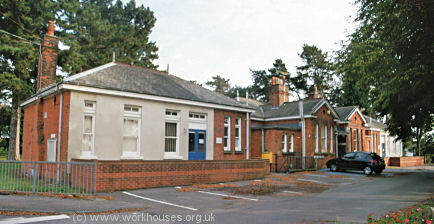 The front section contained the main offices and staff rooms with a water tower at its rear. The staff dining room and kitchen lay behind, linked to the front section by a short corridor. 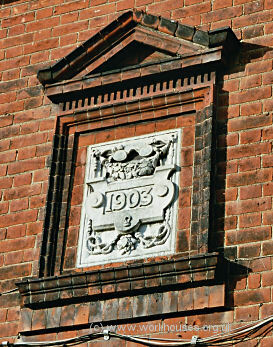 A commemorative plaque records the founding of the school whose purpose was indicated by the inclusion in the design of a pair of spectacles! The two school blocks lay at the centre of the site. 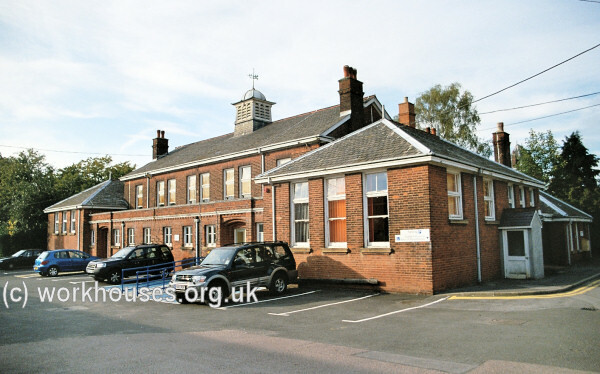 The southern one contained the junior school, and the northern one the senior school. 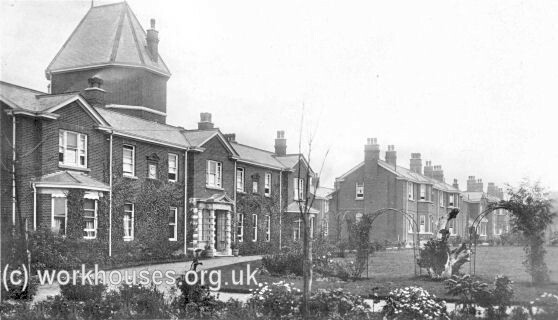 In 1914, following the outbreak of the First World War, the hospital site was loaned to the War Office. From August 1918 until November 1919, the hospital was briefly used as a colony for sane epileptics. It was then mainly used to treat children suffering from tuberculosis (TB) and rheumatic diseases. In 1930, control of the site passed to the London County Council who made a number of improvements to the site including the addition of sun balconies to the patients' blocks. During the Second World War, the hospital admitted general, medical, surgical and orthopaedic cases. In 1940, an Emergency Medical Scheme hospital was erected at the west of the site. In 1944, with the onset of "doodlebug" attacks, the children and staff were evacuated to Northumberland. After 1948, as part of the National Health Service, the hospital continued to provide care for children with TB. 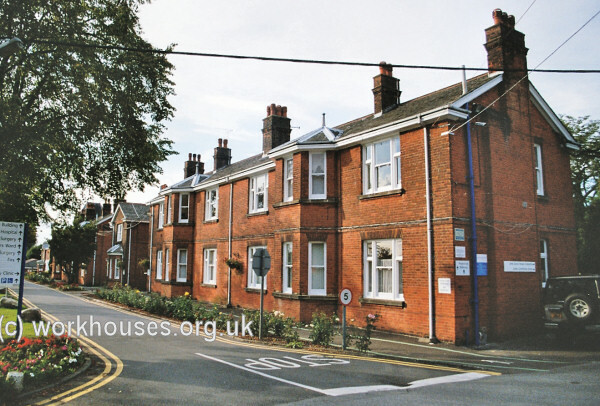 As prevention and treatment of the disease became more successful, numbers declined and in 1959, the remaining 30 patients were transferred to Black Notley Hospital in Braintree. 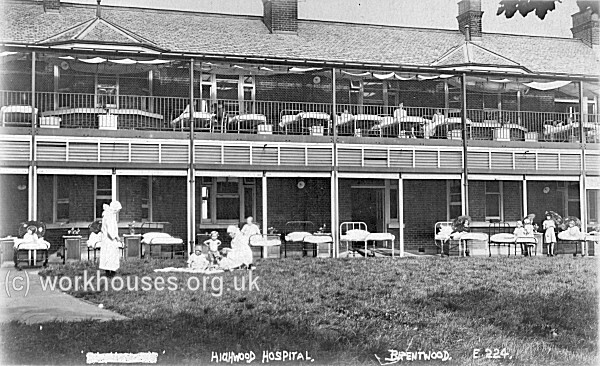 High Wood was then mainly used for long-term geriatric care. 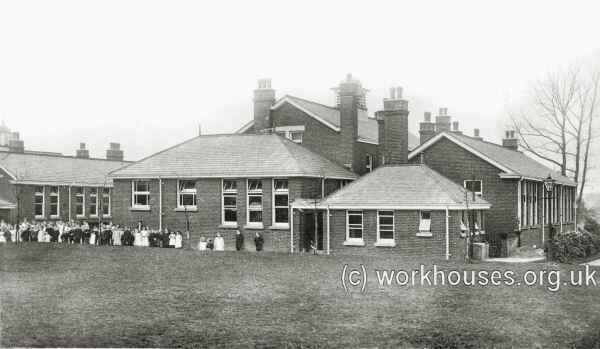 The old EMS hospital, known as Little High Wood, was later used to provide accommodation for mentally handicapped children. High Wood aerial view from the south, 1950s.